Everything happens for a reason. 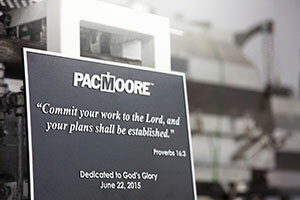 Bill Moore, owner of PacMoore Products believes this is not only true but central to the God ordained PacMoore journey. And it all began long before he ever realized where it would lead. As is the case with most small family businesses, the company has evolved multiple times and in multiple ways over the last 40 years. Bill’s step-father George Meyer not only played a significant role in Bill’s life growing up but also in laying the foundations for Bill’s leadership at PacMoore. George had fought in the Navy in WWII where he experienced God’s hand of protection when his ship was torpedoed by a Japanese submarine. After his service in the Navy George was employed as a grain trader with Pillsbury before forming his own company, M&W Twine, to buy and sell seed and twine in Wisconsin. A few years later he started a pallet re-furbishing business on his family farm in Joliet, IL. The George C. Meyer Company was born. His path intersected with Bill when he married Bill’s mother Margaret. 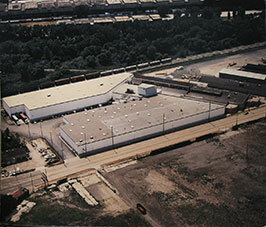 In the early 70s he expanded the pallet company to facilities in Hammond, IN and downtown Chicago. As he became familiar with the Hammond area, George obtained his real estate broker’s license and began purchasing real estate on speculation in NW Indiana after the U.S. steel industry decline caused bankruptcies and abandoned real estate. At one point, he purchased an American Steel Foundry property but was unable to sell it as he had planned. So instead, he formed a partnership with American Maize (now Cargill) to store industrial starch in this building. When American Maize decided to move their operation George worked out a deal with them to purchase all of the stored products that were not within American Maize specifications for sale to their customers for pennies on the dollar. George had good success selling these products, which helped reduce the debt he owed the FDIC who had foreclosed on his property loan. Several years earlier the bank that owned the note on the property filed bankruptcy forcing George to file as well. George was very close to clearing his debt when he died unexpectedly on December 25, 1989. George had been a Christian of the Lutheran denomination who was intentional in practicing his faith, including volunteering to read on air for a local Lutheran radio station. He loved his employees and taught Bill to treat them well. Some things have never changed since George owned the company. In the early days when the company was still struggling George threw holiday parties for employees. That evolved into eventually giving away turkeys to each employee so that their entire family could share in the blessing. That tradition continues today. Other legacies from George continue today such as his emphasis on growth, innovation, managed risk-taking, and embracing change. All of these along with his care of people and desire to honor God have had significant impacts on where PacMoore stands today. Proctor & Gamble graciously gave him an eight week leave of absence and promised there would be a job waiting for him when he returned at the end of the leave. Bill’s brother Cliff continued to make and sell pallets on one side of the building while Bill focused his efforts on selling off-spec ingredients from the other side. He knew little about this industry but learned quickly – identifying the products, where they could be used, and what customers he could find for them. He bought books and talked to people, including those at American Maize. They not only helped him better understand details about the products he owned but also informed him they had a lot more. The products were good food quality, but considered “waste” because they were out of spec for their intended use. Bill’s efforts paid off product by product. These efforts not only pulled the company out of bankruptcy but they caused Bill to recognize there was a sizeable opportunity in his hands. He called Proctor & Gamble back to thank them for their support but let them know he was going to continue running the family business. He not only sold what he had but began buying more “waste” products from Cargill and other corn wet milling companies such as A.E. Staley, ADM, Roquette, and National Starch. Selling products 20 percent under the market price provided a good outlet for his suppliers, a good deal for his customers, and a profitable enterprise for the company. Because the product was going into secondary markets, Bill always repacked each product into new packaging, but also realized he could make even more money by transforming some products into value added blends. In 1991, Bill bought his first blender designed for food grade blending. He set up a lab in his office to analyze each product he had access to and determine the possible blend configurations and finished products he could make with them. Bill’s first goal was to achieve $40k in sales per month which was achieved by the last month of the first year he was in business. Bill’s first major non off-spec project was to process a phosphate blend for Stauffer Chemical – this was a huge shift that would take the company past solely off spec product sales. The next major project was to blend off-spec soy protein concentrate with lecithin for ADM to make it easy to disperse in water. Bill admits that while he had no idea how to do these blends, he was confident he would figure it out. He did figure it out and sales continued to grow at the George C. Meyer Company to the point where 3 shifts of production were added to the operation. 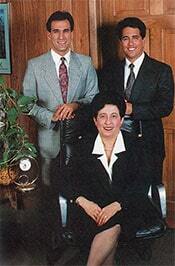 In 1990, Bill, with his mom and brother formed a warehousing company in Chicago called Cal Maize Distributions whose only customer was American Maize. 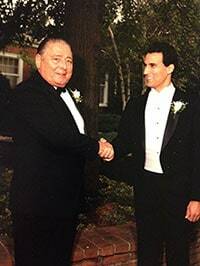 Bill and his family ran both businesses with Javier and Tony Gomez, two of George’s most trusted and long standing employees. Bill and Javier would work at the George C Meyer company from 8AM to 4PM each day then drive to Cal Maize and work there until midnight. Bill’s mother Margaret eventually managed the daily activities of the warehouse allowing Bill to focus on the starch sales. The work was hard but rewarding. God had a crazy way of moving Bill out of P&G where he had felt underutilized, to leading the family business where he was challenged and highly motivated. Then he watched it all go up in smoke. In the early hours of December 16, 1991 while it was still dark the George C. Meyer Company plant burned to the ground due to reasons that have never been known. The fire was so hot that even the building’s huge steel beams melted. To add to the devastation, a firefighter lost his life that day fighting the blaze. Bill was only 29 years old. His wife Susie was pregnant with their second son Kyle. Everything appeared to be lost, but Bill soon realized as he faced the situation that good was coming from the ashes. “My spiritual life had been awakened several years earlier,” said Moore. “I had gone back to church when we arrived in Chicago right after our marriage, and I had given my life to Jesus Christ. Here I was, with my newly found faith and my new family, and now everything was gone.” Bill recalls a deep sense that God was there and was simply testing his faith and preparing him for a much different way of running his life and his business. Bill was forced to lay-off all but three employees. With Javier and his family at his side they were able to rebuild. Loyal customers including American Maize and ADM were essential to keeping the company alive. Before the fire was even out the next morning, two executives from ADM had flown from Decatur, IL to meet with Bill and tell him that they would stick with him if he could find a way to continue. Bill called a friend who had a couple of blenders for sale then flew to Canada to purchase them and was blessed to find that a bagger and sifter were included in the sale. Bill leased temporary space in a warehouse next to Cal Maize for the next two years. They never missed a shipment and sales actually increased the next year. After the fire, his family decided to split the George C. Meyer Company into three entities. 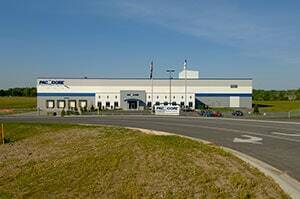 PacMoore Products, Inc. was incorporated in 1992. The next year PacMoore was growing out of the facility next to Cal Maize so Bill began looking for more room. 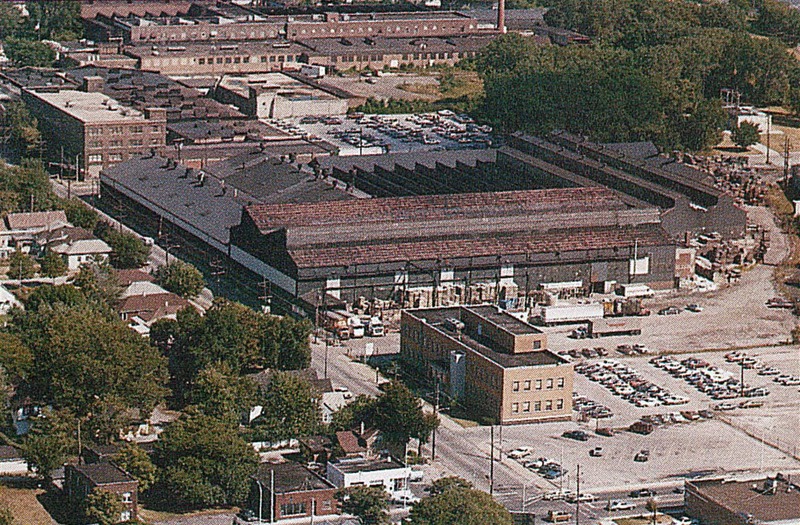 The current Hammond facility on Summer Street was available for sale and once it was purchased and ready, PacMoore moved into it in 1993. Bill learned one critical lesson from that fire: cash on hand is critical to survive any crisis. Bill has carried that lesson forward to this day. The business of buying and selling off-spec ingredients had flattened out and even begun to decline in the late 90s but Bill had prepared for this by shifting his emphasis to selling contract manufacturing services. As the company continued to grow Bill brought in a sales leader and shifted his own role more toward operations, managing the schedule, office work flow, and creating systems for all of these while also continuing to work on product solutions to solve customer problems. In 2001, Bill hired his first plant manager and began to build a management team to support the growth of the company. With three full shifts and four production lines running every day, the business was becoming more than he could handle alone. In 2003, Bill flew to New Jersey to meet with the president of National Starch to discuss a long term relationship. The Hammond facility was limited in its ability to expand so once a 5 year contract was established with National Starch to support their needs, Bill began building a new facility in Mooresville, Indiana. Bill’s vision for this facility was that this would be the place where PacMoore could focus on growth in technology and innovation – and that vision continues to be realized in the present day through the additions of spray drying and extrusion capabilities. Bill was convicted of the need to follow through on this expansion as he spoke in front of his church trying to convince them to take bold risk and expand into a new facility. Bill’s reading of the Parable of the Talents in Matthew 25 was also a confirmation that this was the path God was leading him on, challenging him to invest his resources to grow the kingdom of God. In April of 2006, the new facility was dedicated to the Lord in a public ceremony with many local officials in attendance. Bill took on another calling in his personal life during this time. For eight years he led a men’s Bible Study Fellowship in the southwest suburbs of Chicago that was attended by 300 to 400 men regularly. His training and increased understanding of God’s Word during this time deeply impacted him and helped him realize he was being called to love and bless his employees to a deeper level. Leviticus 19:9-10 was a passage that especially moved him to action. PacMoore established a Christ-centered, servant leadership model based on the influence of scripture. ESL and GED classes were added for production workers and supervisors. In 2006, chaplains were brought in for both facilities to minister to employees at a more personal level. Employees at PacMoore are hired based on their abilities and experience but are also given the opportunity to bring faith into their daily interactions and decisions. Employees are also hired when they demonstrate a desire to capitalize on a second or third chance. A more recent example of this is PacMoore’s willingness to provide jobs to young men and women in the Indiana Dream Team (IDt) and Work Release programs in Morgan County, IN. The program provides a last chance for reformation for young people on their way to prison. Many of them have grown dramatically in countless ways while at PacMoore and have become valued employees. In 2007, sales took a dip due to business declines experienced by a few key customers at the same time. Bill was determined to prevent the loss of momentum through this business cycle, so senior management was added in addition to a sales and marketing staff. The office staff shifted from a customer service model to a customer account manager model (CAM) that emphasized a more skilled and experienced approach to customer service. Investments were made in new capabilities in the areas of spray drying and consumer packaging. 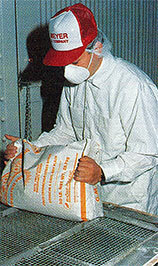 Pilot equipment was increasingly utilized to lend assistance to customers in the area of product development. It was also during this time that PacMoore spent time speaking with customers to discover what they felt made PacMoore unique and differentiated from other suppliers. Their response led to a value proposition statement that highlights our ability to grow and impact people, solve customer problems, and protect our customers’ interests in multiple ways that are essential to them. Over the course of the next seven years sales would more than double from $12MM to $25MM. Most importantly, a new emphasis on spiritual growth at PacMoore had established the Moore than a Customer program (to reach out and pray for customers), management prayer meetings, National Day of Prayer, Spiritual Fellowships, Bible Studies, prayer partners, and more. 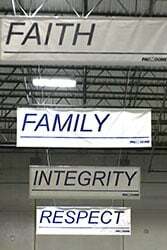 And our values of Faith, Family, Integrity, Respect, and Excellence continue to guide not only what the company does but how it is accomplished. PacMoore is starting to move into that space to provide food. “We know the industry and the process,” Moore said, “and we have connections to the broader industry and the large companies that are too big and have shareholders to satisfy. They want to be involved, but need someone like PacMoore to start it which allows them to come in to support it later. PacMoore continues to work on growing its core food contract manufacturing business as well, knowing that it is the engine that drives all the other work. 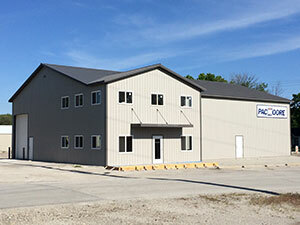 The company’s most recent addition was the building and inauguration of the PacMoore Innovation Lab in Gridley, IL which is initially focusing on product development and validation of food extrusion processing projects. The secondary phase of this initiative is currently in process which is the installation of a full scale extruder in the Mooresville, IN facility which will take on projects ready for large scale production. The future will certainly contain more initiatives. 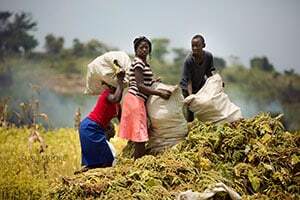 In fact, work has already begun to produce millions of meals for people in Africa with the hope of building plants in their communities so Africans can feed Africans, and poverty can be dramatically diminished. 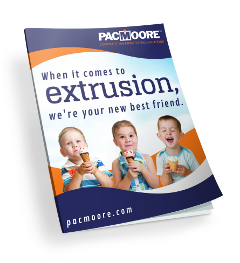 The history of PacMoore is one full of both successes and setbacks. Each of them has been used by God to make the company what it is today. One thing that is certain – God is not done using what has been committed back to Him.